When you’re looking for a white gold wedding ring, I think you’ll agree with me that it can be hard to find the trusted information you need. It’s hard to even know which questions to ask when purchasing this important piece of jewelry. Alloys, gold content, hardness, white metal allergies, handmade vs. machine made, ethics and traceability; the list goes on and on. All of these components should be considered in selecting you and your partner’s wedding rings. Here, you’ll get the real story on white gold wedding and engagement rings from my twenty years of being a jeweler. Best of all, this is likely the most comprehensive single article on white gold wedding bands online. The term, caret derives from ancient Greek-Roman times, referring to the weight of a carob seeds. Karat (a variation of carat) now has come to mean the percentage of fine (pure 24K) gold in white gold wedding rings. We will be looking at karat. 2. 14 Karat vs. 18 Karat: What’s the Difference? A 14K white gold ring is .585% percent pure gold. An 18K white gold ring is .75% pure gold. What makes up the balance of the metal is alloy. The alloy composed of white metals mixed in the 24K gold is what makes the yellow gold white in color. Which Karat Should You Choose for Your White Gold Wedding Ring? Here’s the deal: Whether 14K or 18K white gold is best for you depends upon four factors: karat, hardness, whiteness and alloy content. 3. 14K or 18K Factors. The 18K gold hallmark on the back of white gold wedding bands has more cache than a 14K stamp. Gold, whether its 14 or 18K, is often equated to value, prestige, and achievement, the Olympics are a great example for this. 18K white gold wedding rings have a more yellow tint because they have 25% white metal alloy, as opposed to 41.5%, as in 14K white gold wedding rings. 4. Whiteness of the Metal. These photos, displaying 2 variations of the garden gate wedding ring show a 14K white gold ring on the left vs. an 18K white gold wedding ring on the right. Although very subtle, the right ring has a slightly more yellow tint. How white do white gold wedding rings have to be to be considered “white enough”? The term itself, “white gold”, is by no means standardized. White is actually a very large spectrum, overlapping on the borders of a brown tint, pale yellow or even rose. To solve the issue and make an 18K white gold ring even whiter, jewelers often use rhodium as a plating material. Rhodium is a naturally white metal. 5. The Rhodium Plating Option. Rhodium plating involves putting a thin coat of rhodium over a white gold ring. It’s controversial among jewelers. I don’t recommend rhodium for many reasons, but one very simple reason is due to the maintenance. Plated rings have to be “re-done” several times over the years to maintain their presentation. What’s The Story With White Gold Alloys? Alloys used in white gold wedding bands are typically nickel, copper and zinc. The controversial issue here is nickel, which is the most common ingredient in white gold alloys in the US, but generally not the best recommendation. It does have its advantages though. Nickel’s advantage is that it is both strong and hard, which makes it particularly suitable for white gold wedding rings. Copper is also added in various percentages to increase malleability. Like stated before, nickel is a common alloy used in the US, but in the UK and much of the EU, nickel is not allowed due to common allergic reactions. So, alternatives can be used in its stead. 7. Allergic Reactions To White Gold Wedding Rings. How common are nickel allergies from wearing white gold wedding rings? I see instances of it in my store about once every year or two. So, not very often, but it does occur. If this is of concern to you, you have good alternative options. White gold wedding bands can be alloyed with palladium and silver. Palladium is a natural white metal in the platinum family. Using palladium can add 15% or more to the cost of a white gold ring. Allergies to gold with palladium and fine silver alloys? Worry-free. However, it is still possible to get an allergic reaction from a wearing a white gold wedding ring that has nothing to do with the alloys used. 8. Rashes From Wearing a White Gold Wedding Ring. Skin irritation can happen when wedding rings are too tight. Also, with wedding rings with accent gemstones, bacteria can secretly lurk inside the small holes between the gemstones and fingers. If you are the unfortunate victim of this irritation, consider upsizing the wedding ring, clean it, or have it cleaned professionally by a jeweler. Also, leave the ring off for a little while to give your skin time to breathe and heal. A more detailed medical blog on white gold wedding rings and their allergies can be found here. Before we move on, there’s a little more you should know about alloys. They also function to make rings more durable. This Wikipedia gold chart shows some of the possible alloys and how they relate to the color of gold. 9. Durability of Gold Due To Alloys. Pure gold is naturally a very soft metal. Alloys are used to make the gold hard and durable enough to wear. Pure gold (24K) has a low MOH sale rating of 2.5 out of 10. 18K is harder than 24K and 14K is harder than 18K. This chart below is helpful. It compares all white metals. The less gold content and the more alloy, the stronger and more durable the ring. 10. Heaviness Of A White Gold Wedding ring. Heaviness is equated with the density of a ring. The heavier the metal the more dense it is. Gold weight varies slightly due to the alloys that are used in it. For example, if nickel is used as an alloy, the ring will be heavier than if palladium is used as an alloy. Here are three more factors that can affect the weight of your white gold wedding band: the size, its thickness and gemstones. 11. Our Recommendations On Karat, Hardness, Whiteness and Alloy Content. Unless the notion of having an 18K white gold wedding ring is critical because of higher gold content, we recommend going with 14K. The 14K white gold wedding ring is whiter, stronger, and less expensive as well. 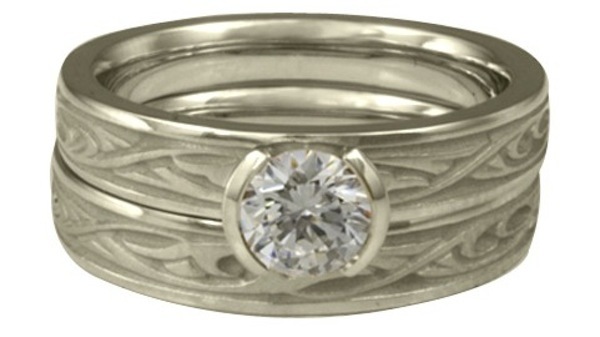 If you want natural white metal, go with a platinum wedding ring. If platinum is too expensive, a palladium wedding ring is an excellent alternative choice as well. Palladium is also naturally white and has gained popularity over the past fifteen years. Palladium is around the same price as 14K gold. Here’s a more in depth comparison between platinum vs palladium. 12. One Other Consideration: Metal Tonality. Some of my customers prefer gold just because it feels warmer than platinum or palladium. Gold, symbolically, represents perfection, the alchemists dream, wisdom and wealth. Gold itself is synonymous to high quality, happiness and energy. Gold is also a wonderful metal to work with. It can be shaped and formed by hand as compared to palladium and platinum, which are more difficult to work with outside of the casting modality. Our polishing room at Reflective Images Jewelry. 13. Basic Cleaning and Getting Rid of Scratches. Use a polishing cloth designed to clean jewelry to get the surface area of your white gold wedding band. Cleaning solutions for gold and a regular household rag also work. 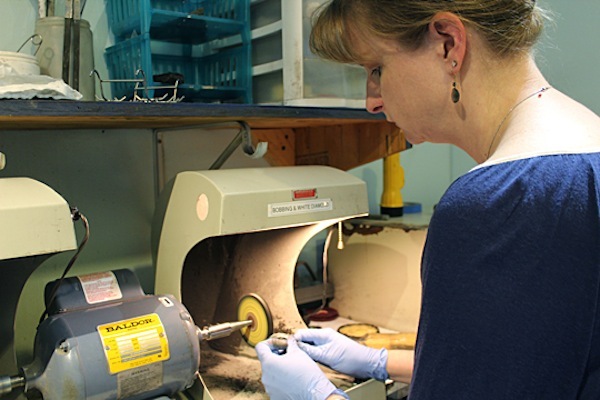 Scratches can be removed using a polishing wheel by a jeweler. Unless the scratching on the white gold wedding band is deep, the ring should look like new. Gems dull out overtime due to body oil and dirt. A sonic cleaner can bring the ring back to its original luster. 14. The CADCAM file process. 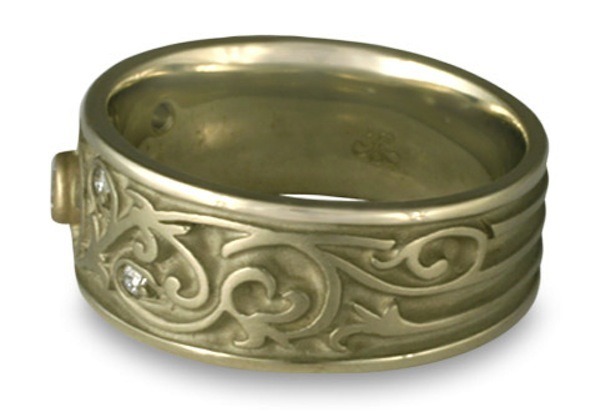 Most white gold wedding rings are created though CADCAM from which molds are created by a modeling machine. This is the method with any large jewelry chain and some smaller jewelers as well. Die struck jewelry involves two pieces of steel, which are struck together, including the master die, which thus creates the piece from a single piece of metal. The two are struck together with up to 50 tons of pressure to form a piece of platinum, palladium, or gold into a wedding ring. 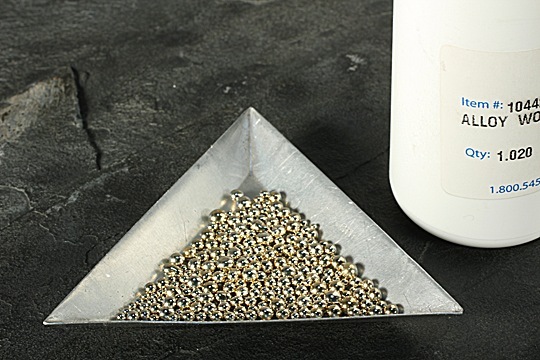 This uninspiring mass production method is common in large-scale jewelry manufacturing processes. thencreated to cast a white gold wedding band. 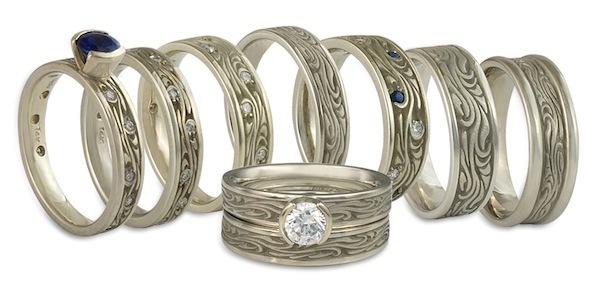 Some white gold wedding bands are created with waxes carved by hand. These are then casted out, sometimes as one-of-a-kinds. This takes great skill to master. A few companies, such as my own, work primarily with sheet, wire and design elements in order to create white gold wedding rings by hand. 18. What’s The Difference Between A Men’s White Gold Wedding Ring And A Women’s? Men’s white gold wedding bands as a rule are wider because men generally have bigger hands than women, but of course this is not always the case. Every hand varies from another. Most men’s white gold wedding bands fall within the 5mm to 8mm width. Men do not typically go under 5mm; with the exception perhaps of comfort fit wedding bands. Also, men do not typically wear an engagement ring with a wedding ring, though there is an emerging trend for men's engagement rings. 19. A Wide or Narrow Wedding Band? One advantage of a wider wedding band includes the space on the surface of the ring, which allows for great design and detail. In our impressionistic Starry Night wedding ring collection, the design varies, from subtle to pronounced, depending upon the width of the wedding ring. If you’re more drawn to the classic plain wedding bands containing no design, this concern around surface area of the ring is not so much of an issue. 20. What Is The Average Width Of A Women’s White Gold Wedding Ring? The average width of a white gold wedding ring for women tends to be from 2mm to 5mm wide. The widths for women’s wedding bands are generally narrower than men because women more often than not have smaller hands. Also, women commonly wear their engagement rings and their wedding bands at the same time. Most women are not comfortable wearing a bridal ring set with a combined width of 8mm. 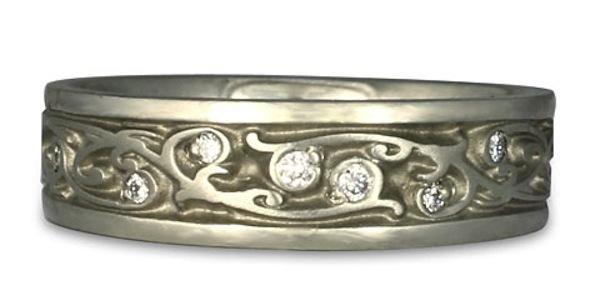 With a custom jeweler working within design patterns, width and design can be varied. On our men’s wedding rings, the borders are generally 1.5mm. In some of our other mens wedding rings, the borders can be 2mm wide. We can make a border over 2mm or take it down to 1mm. We can even eliminate a border entirely, making the ring “borderless” and therefore narrower. 21. How Will Your Bridal Ring Set Fit on Your Finger? This is an important question to consider if you’re planning on purchasing an engagement ring to match your wedding ring. Some white gold rings are designed to match while others will move about on the finger. 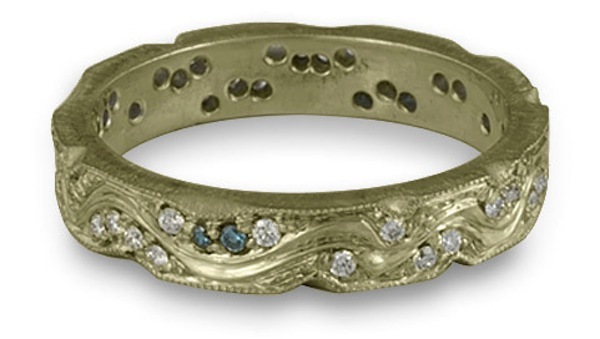 For example, the Donegal Twin Bridal Ring Set will only stay together if the pieces are soldered together. The Flores Bridal Ring Set shows two rings with surfaces that are in complete contact. The rings are more likely to stay together on the finger, depending, of course, upon the fit. Ultimately, width, weight and design are all very subjective components. It’s all about what feels most comfortable to you. 22. Does Your Wedding Band Have to Match Your Partner’s? You can choose not to match or choose to match metal type, design or elements of a design. The simple answer is, whether you and your partner choose to have matching rings or not is entirely dependent upon your personal preferences. 23. How Thick Should Your White Gold Wedding Band Be? Width impacts durability, the wider a ring, within the same metal type, the more durable. 24. The Width of a Ring vs. the Thickness of a Ring Makes a Difference. A ring of 1.5mm thickness that is 1.5 mm wide is not going to be as strong as a ring that is 3mm wide. The softness or hardness of the metal also factors in with width and thickness to influence the durability of your ring. (Please see Metal Hardness chart above). Also, as shown with some of the wedding rings above, a border can make your ring strong and durable and it even protects the interior design. 25. Any White Gold Wedding Ring Can Be Resized. Whether it is difficult or easy depends upon the ring. The difficulty can depend upon if there is a pattern designed into the ring, or gemstones set in the wedding band. White gold wedding rings with gems can also complicate resizing, but nonetheless can be resized. When a resizing a ring with flush set gemstones, the stones often have to be reset. Sometimes the stones need to be taken out of the ring, and then reinserted. When you have a flush setting as shown below, its best to get the sizing right the first time. A simple white gold wedding band can be stretched up to half a size, or cut down to any size. But what if the ring has to be cut and there is a design? Some rings have sizing bands, which break the pattern and allow a ring to be sized up or down more easily. But often, talented jewelers build the sizing band into the pattern, so as to work with it and maintain the ring’s beauty. Like the ring shown above. However, if the ring rotates or turns on your finger, the sizing band shows instead of the desired motif. 26. Which Accent Gems are Suitable for White Gold Wedding Rings? Softer gems, such as garnet or amethyst, can get scratched and dull out over the years. They are also more difficult to find in extremely small sizes, but it can definitely be done. Diamonds are the best choice due to their hardness and scratch-resistant properties. Sapphires and rubies, though not as durable as diamonds, still work very well and look amazing. 27. The Ethics of Your Wedding Ring Definitely Matter. I think you’ll agree with me when I say that you don’t want to wear a wedding ring, which symbolizes love made with gold that has destroyed communities and ecosystems. Would you? Of course not. Yet, for the vast majority of people, that is the norm. They simply aren’t aware there is an alternative. 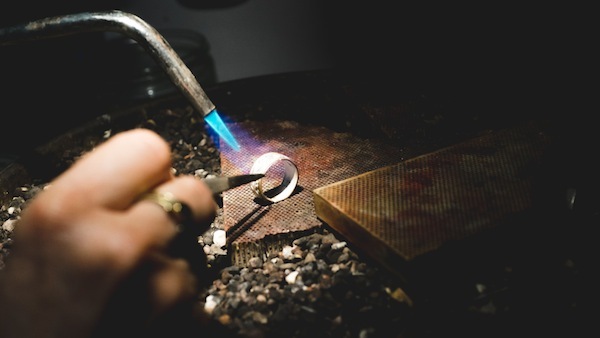 These days, jewelers market recycled gold wedding rings as the alternative “eco-friendly” choice, but to make a claim that using recycled metal makes a reduces the impact of mining to the environment is simply not true. Without question, the most ethical gold is Fair Trade gold, but if you want a detailed comparison as to why, review our article here. Just like Fairtrade has changed how consumers view coffee and chocolate, Fair Trade gold will one day alter how people view jewelry. Our company in Santa Fe, New Mexico, is the first Fair Trade gold jeweler in the US and we offer an extensive line of Fair Trade gold wedding rings, such as through our Valerio brand. By buying a Fair Trade white gold wedding ring, you will join a movement. 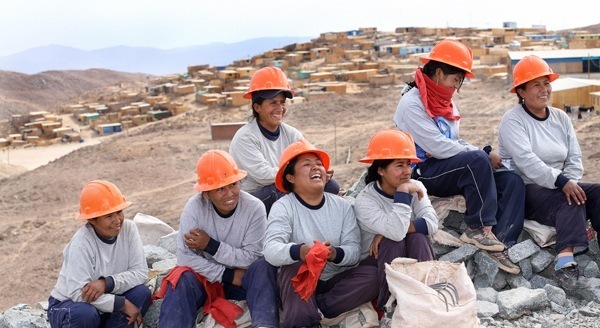 In addition to what your ring means to you, it will also help alleviate the poverty of miners, their families and millions of people around the world. These ethical considerations are particularly significant because wedding rings are the most important piece of jewelry you own. Not only are they symbols of your enduring love, but they are exchanged as public signs of ceremonial commitments. Even the shape of a wedding ring, the circle itself, which is a blueprint behind the creation around us, is talismanic. Who makes the ring, the miners who mine the gold, and the metals and gems used in its creation, all have significance and resonance as a symbol that connects you the greater wholeness of this world.